Industrial hemp is a business, agricultural and an environmental story about a sustainable crop that requires no pesticides or chemical inputs, is drought tolerant, and can provide a source of tens of thousands of jobs in every U.S. state. The current U.S. hemp market is more than $600 million. Unfortunately, those sales are based on imported hemp — rather than domestically-sourced hemp grown by American farmers on U.S. soil. The National Hemp Association is dedicated to helping American farmers earn a living growing this environmentally sustainable cash crop, making hemp fully legal at the federal level, and rebirthing hemp’s return as a major American crop. Please contact us and we will respond quickly to answer questions, provide high quality images, and connect you to a hemp expert to interview. 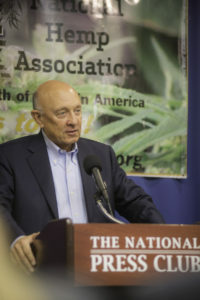 Below please find hemp stories organized by topic, downloadable news releases, photos of NHA events, and a comprehensive hemp backgrounder. Willie Nelson (right) greets hemp advocates at the NHA 5/25 event in Asheville, NC. 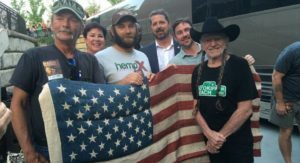 Pictured right to left: Willie Nelson, Jason Amatucci of the Virginia Industrial Hemp Coalition, Mike Bowman, NHA Board Chair, and local hemp supporters.